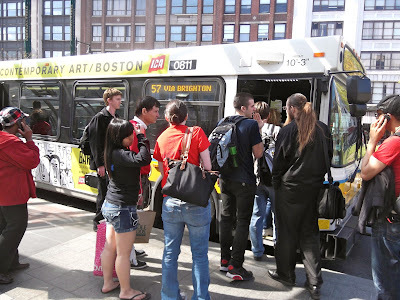 After what seems like forever, here's a regular MBTA bus review! Unfortunately, my computer was acting up, so this is very late. Anyway, the 57 was requested to me by TheMBTADog, and since I had taken the bus already, I figured I'd review it. People often wonder why on the Green Line, there's the B, C, D, and E branches, but no A. Well, there used to be an A Branch that went to Watertown Square, via Union and Oak Squares (it was mentioned in my 52 post). In 1969, the route was eliminated, but the tracks to Watertown remained because there was a yard in Watertown. It wasn't until the 1990's that the tracks were destroyed. There remains a stub of the former track at Packards Corner on Commonwealth Ave. Anyway, the 57 is the bus replacement for the A, and based on the crowding, it's certainly worse than the former light rail. The bus starts at Watertown Yard (not Square), where there were a fair amount of people waiting. The bus then follows the 52 (and the 502/504 express buses to Boston) down Galen Street. After making the loop around the Crowne Plaza, it makes its way to Tremont Street, which is a residential area, along with the 501/503 buses to Brighton Center from Boston. It then reaches Oak Square, the part-time terminus for the former A Line, as well as the terminus for the 57A short-turn from Kenmore. Oak Square has some assorted small businesses, as well as a large YMCA that I took swimming lessons at as a kid. The 57 at Watertown Yard. Note the old A Line tracks the bus is crossing. It gets fairly urban after, with a small shopping center and three-to-four-story apartments. The bus then enters Brighton Center, a lovely area with small businesses with apartments on the upper floors. This is another important transfer point. The bus goes by the massive Saint Elizabeth Medical Center, and Washington Street becomes Cambridge Street. The bus passes a large park/forest area, and then it gets more suburban and residential. It isn't long, though, before things get urban again in Union Square and the bus turns onto Brighton Ave. Union Square is mostly one-story small businesses, but there are a few taller buildings here and there. As the bus gets closer to Boston, some large chains start to pop up among the lesser-known places. I haven't said much about ridership this post, but let me just say that at this portion of the ride, the bus was so crowded that the driver wasn't letting people in. Luckily (well, sort of), there was some bunching, so the bus right behind us was able to pick up the stragglers. Soon, it gets more residential with some apartments. However, businesses pop up again as the bus gets closer to Commonwealth Ave. Note as you're riding (whether it's the B Line or the 57) the small stub track of the former A Line here. For the rest of the ride, the 57 runs alongside the Green Line tracks to Kenmore. As one would expect, it's quite urban along this stretch, including the many buildings of Boston University. Soon after, the bus enters the Kenmore Square busway with many people getting off. There was also a throng of people waiting to go back to Newton and Watertown. "Feed me," said the bus. Ridership: Lots and lots and lots of people. I counted over 80 in total. Many of then went to Kenmore, so I'm assuming there was a baseball game they were all attending, although I can't be sure. Since it serves B.U., it probably gets its fair share of student riders, too. Pros: Being a Key Bus Route, the bus has a great schedule, running about every 10 minutes, Monday through Sunday. During rush hour, the 57A also runs every 10 minutes to Oak Square, providing additional service. The bus serves a large, mostly urban part of Newton and is the sole service along most of its route (aside from the rush-hour only 501 and 503 express buses). Taken on its own, it's a pretty good bus. Cons: Unfortunately, when compared to the A Line, the bus is ultimately (and expectantly) worse, mostly because of its crowding. Articulated buses would be great on this route, especially considering that the 39, which replaces the former E Line to Forest Hills, uses articulated buses. The 57 also has the typical nuisances or Key Bus Routes, namely the aforementioned crowding and bunching. Nearby and Noteworthy: Aside from B.U. and Kenmore Square (the latter will be talked about most likely in a later post), Watertown Square (on the northern side of the Charles) has a staircase that leads down to a dock/platform area right down on the river. It's a really quaint, beautiful area, made more so by the fact that I went there at sunset. This bus has a lot going for it; the schedule and the large area served are the two main pros. However, 80 people on a single bus ride? I don't know if the bus is usually like this, but that is very overcrowded. As I said before, articulated buses would benefit this route greatly. There's also the bunching, but that's pretty much a given for a Key Bus Route. 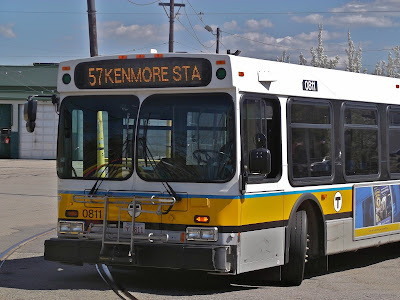 Latest MBTA News: The Orange Line is running shuttle buses from Sullivan Square to Oak Grove at random dates...check the website to see if any affect you. 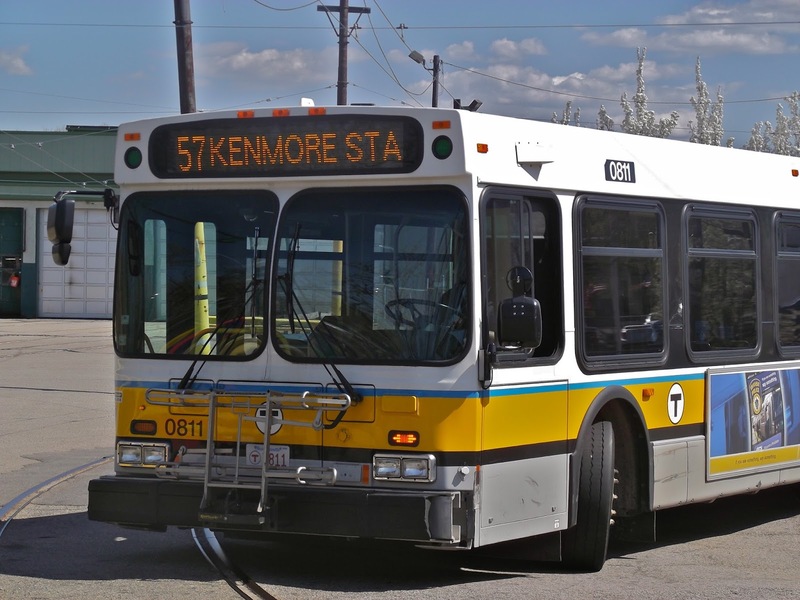 The MBTA is stressing the fact that some bus stops are being eliminated or moved as part of the Key Bus Route Improvement Program. Click here for more information. You've probably found out about this already if you live in the area, because I'm very late on this, but Salem Depot is now closed. All Salem buses are being rerouted to a new busway. Also, the MBTA has announced the winners of its map contest. You can vote on which one you want to win here. And the MBTA also has a new safety video that's very...weird. Watch it below or here. Comment your opinions, I want to see what you guys think of this. I grew up around this route in the mid and late 2000's and know that during the weekdays, the 57 runs NEOPLAN buses, but during the weekends, they used to run the NABI CNG buses. However, since the NABI's are all but extinct now, what buses run this route on the weekend? Are they the 2008 New Flyer buses, as seen in the photo above? Mainly 2016-2017 New Flyer XDE40 buses and some XN40 buses. I wish napoleons went on the 57 7 days a week, so junkcelsiors would not have to go on the route. Dude! You gotta get up wicked early someday and take this bus all the way to Haymarket! One of the worst bus rides I ever had. I rode the A Line as a college student. Wasn't fast but you sat on comfy upholstered seats which allowed you to enjoy the ride high above street level. More civilized times.